It’s the internet. Makeup tutorials, hacks, tips, and tricks abound. What’s the newest hit, you ask? Using unibrows for even eyebrows. Of course. We’re no secret to unconventional beauty secrets. After all, what’s life without a little creativity? And how will a makeup routine get hits if it isn’t in any way weird or quirky? But while beauty hacks come and go, the need for perfect eyebrows remain. If, like the rest of us, you can’t afford a makeup artist at your beck and call, then you definitely resort to DIY makeup looks like we do. So, without further ado, here’s your next beauty experiment: unibrows for even eyebrows. To be honest, the idea isn’t so far-fetched. It’s actually pretty logical. 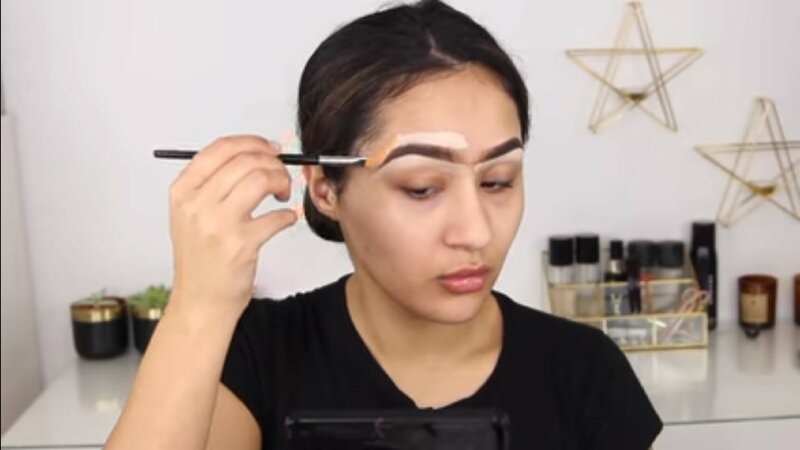 To get perfectly even brows, draw a line across your forehead connecting your two arches. This technique ensures that your brows are of the same width. The unibrow technique is a great alternative if you’re not into eyebrows stencils. Plus, you can use your brows’ natural shape as your guide. The unibrow technique works best for girls with uneven brows. Outline your eyebrows as you usually do. Extend your outline so your brows meet at the center of your forehead instead of ending above your nose line. Fill in your brows as you usually do. Erase the extended brow outline using concealer and foundation. Unibrows aren’t just a trend or a makeup technique, however. For some people, it’s how their eyebrows look naturally. Society conditioned us to think unibrows are ugly or messy. That’s not the case. For instance, 21-year-old model Sophia Hadjipanteli is making waves and challenging our perceptions of beauty just by existing. Just by letting her eyebrows be. “I was in Cyprus, and I wasn’t plucking my eyebrows because I didn’t really have time—I was always swimming or something,” Sophia told VICE. “So, when I got back to my grandmother’s house in London, she told me how pretty she thought I looked, and I kind of realized I had a unibrow at that point. And I just left it. Despite death threats and daily hate messages, Sophia isn’t letting up. The unibrow movement is light years behind the kind of impact Sophia Hadjipanteli is making. Still, it helps get rid of the stigma associated with unibrows. Instead of seeing them as ugly or disheveled, we see how they can make us look and feel fab. That’s a step in the right direction, at least. There are dozens of other beauty hacks for your brows on the internet. However, the only real hack you need is the one that will give you both beautiful and long-lasting eyebrows. We’re talking about microblading, also known as permanent makeup or cosmetic tattoos. Microblading is just a fancy word for a tattooing technique that uses tiny incisions. Microblading artists deposit microblading ink pigments into these incisions. Microbladed brows last up to 2 years with proper aftercare and maintenance. That reduces your makeup routine significantly. You go from 1 to 2 hours a day to an hour a year. Yep, microblading only takes an hour of your time. Interested in learning more about microblading? Check out our article, What microblading is for: Permanent makeup, explained. You can also send us a message or call us at 310-207-7797.